Anthos is based on the Cloud Services Platform that was first announced at last year’s Google Cloud Next, and launched as a beta earlier this year. The service is now generally available, and in the spirit of its multi-cloud approach, is available both on Google Kubernetes Engine (GKE) in the cloud, and on GKE On-Prem. Anthos will let organizations manage workloads using the same interface on the Google Cloud Platform (GCP), on-premises using GKE On-Prem, and even on rival clouds such as Amazon Web Services (AWS) or Azure. The idea is to offer enterprises the seamless ability to manage workloads across cloud platforms without the need to learn new environments and APIs. As a managed service, the latest capabilities of Anthos will always be available while organizations don’t have to worry about security patches. In a live demonstration, the company also showed off a new cloud migration service called Anthos Migrate to convert an e-commerce site from a virtual machine into a running container on GCP. An instance running on the public cloud platform of rival AWS was also shown. By migrating to Anthos, organizations are freed from tasks associated with traditional virtual machines (VMs) such as VM maintenance and OS patching. Enterprises can also take advantage of other integrations within Anthos, explained Manor and Google Cloud’s SVP of Technical Infrastructure, Urs Hölzle, in a joint blog post. Anthos Migrate is currently in beta. “You can actually install and start running [Anthos] in less than 3 hours. It provides monitoring, logging, visibility, and CI/CD coding. You can increase your increase your developer and operator philosophy on premises, and in the cloud, in a consistent way. This is the new reality world we’re bringing to you,” said Manor. Anthos represents a strategic shift by Google Cloud to support multi-cloud environments, and offers programmatic APIs. This means that a new cloud configuration can be made and applied across all systems that it manages at once, giving enterprises seamless governance regardless an actual workload’s environment. 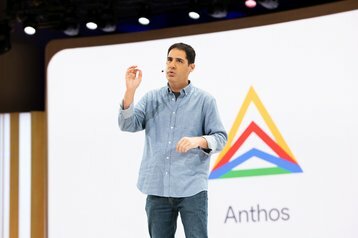 Anthos isn’t a lone-ranger effort, and Google was quick to highlight that Anthos is launching with support from an ecosystem of more than 30 hardware, software and system integration partners to help its customers take full advantage of the service. Some Anthos integrations announced by Google include networking giant Cisco, with support for various products including Cisco HyperFlex and Cisco SD-WAN, among others. Other partners include VMware, Dell EMC, HPE, Intel and Lenovo to deliver Anthos on hyperconverged infrastructure (HCI) systems.